I think I have spent more money (& time) at Orange Grove Markets in 2013 than any other food outlet – coffee, fruit & veg, the amazing Honest to Goodness stall & amazing spinach & feta Turkish gozlemes. Not to mention $$ on the pony rides & jumping castle. In saying that, I’m proud to be supporting local farmers & business. This weekend was the last market of 2013 so I decided to buy at least one product I have never bought before: enter OYSTER MUSHROOMS! 1 tbspn GF soy sauce – please check the labels as I noticed a soy sauce containing sugar. *optional: 1 small red chilli, chopped. 2. Throw in the sesame oil, then all the mushrooms. 3. Stir constantly so they get a good coating of sesame oil. 4. Once they start browning, throw in the coriander & soy sauce. Stir another 30 seconds until the coriander slightly wilted then place on a plate. **i let the mushrooms cool down so they were served warm as it was a hot day but this is your call! 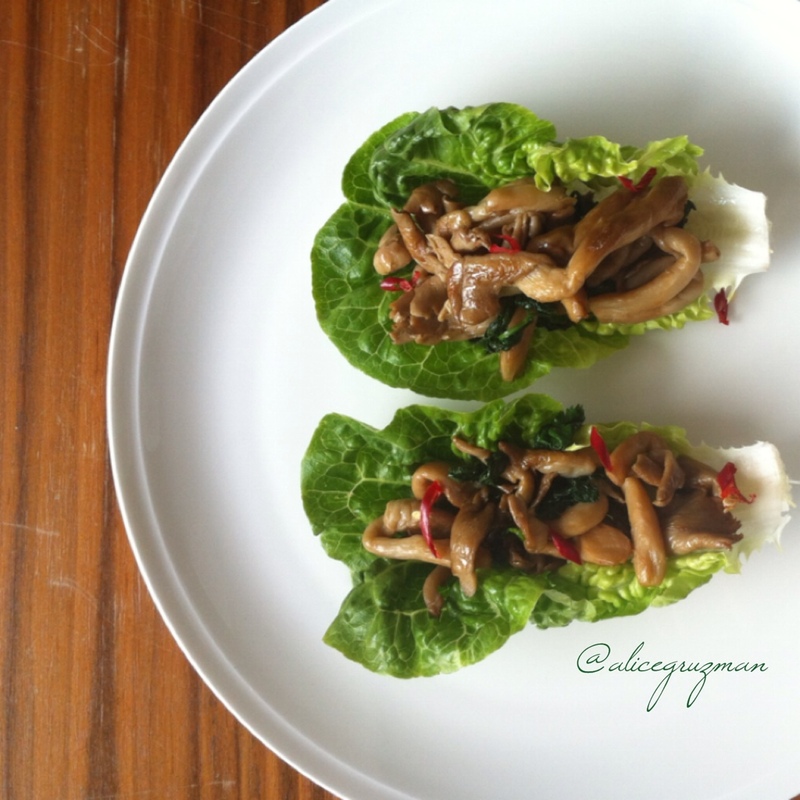 This entry was posted in Recipe and tagged chilli, cleaneating, coriander, Health, healthyeating, iqs, lettuce, lettuceboats, mushrooms, nourishingfood, oystermushroom, Recipe, refinedsugarfree, sesameoil, soysauce, vegan, vegansanchoibow, vegetarian by 6 Clean Ingredients. Bookmark the permalink.